It may seem a little strange at first, but as far as Millennials are concerned, email isn’t considered a new media. Email is the digital side of what is now categorized as traditional media. Millennials, therefore, use email very differently when communicating with brands. Knowing what these idiosyncrasies are and tailoring your Millennial email marketing strategy to them will help you maximize the potential of this platform. Email messages targeted to Millennials won’t necessarily align with the content you create for Millennials on other channels. Instead, you need to pay close attention to the responsiveness of Millennials to specific types of emails and build your content strategy around them. Research from email marketing company Adestra found that the most popular reason a Millennial wants to receive an email from a brand is to receive a coupon or a discount. This preference mirrors what was seen regarding newspapers. Millennials are extremely price sensitive. Leverage email as a component of your overall strategy as opposed to thinking about email in a silo. Build subject lines and headings that capture the attention of your audience right away. Receiving an email from an audience member is often the first indication that he wants to take the relationship with your brand a step further. While someone may like your Facebook Page or follow you on Twitter, nothing is quite as intimate as signing up for your newsletter or providing you with an email address. Personal information is seen as a form of currency by Millennials. Segment your Millennial email lists as narrowly as possible. In order to target your messaging to the specific behaviors and tastes of Millennials, narrow your segments. Millennials respond to personalization, and the best way to drive up conversion rates is to keep your lists segmented, and your messaging highly targeted. Leverage diverse types of email campaigns. Of course, Millennials respond to coupons and discount offers, but email list-building tools like Constant Contact provide many variations of email campaign types. Run a campaign that collects survey data or asks for some sort of action that Millennials can take within the email. You may even sell tickets or products directly from the email. These examples are both readily available and mobile-friendly, which is most likely where Millennials will be checking their email. Cross-match email addresses on Facebook and Twitter. You can cross-match email addresses on different platforms to better target your ads. Improving the targeting of your ads by performing this task leads to higher click-through rates, lower cost-per-click, and ultimately, increased conversion rates. 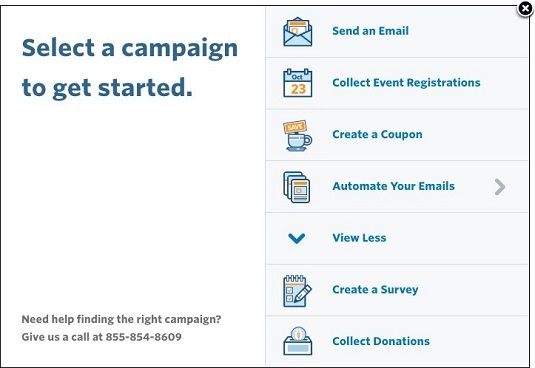 Different types of campaigns available in Constant Contact. Increasing open and click-through rates starts with the subject line. That is the first thing your audience is going to see, and it can really be a make-or-break moment. Keep your subject line as short as possible. The majority of your Millennial audience is checking email on a mobile device, which means less screen space for your subject. It also means that a novel-length subject line will be cut off before you even hit the main point. Personalize your subject line with personalization tokens. A common theme across all marketing channels is the desire for a personalized experience. Personalization goes for email as well. If you have an option to personalize the subject line using a token in your email software, take advantage of it. Personalization tokens are small bits of code found within your email software that automatically populates a designated space either in your subject line or the email body itself. It pulls out certain personal elements from the profile of the user receiving the email. So, John’s subject line will read something like “Hey, John! Collect Your Reward Now!” and Mary’s subject line will swap out John’s name for her own. Be clear about what recipients will see in their email. Don’t be vague or mysterious about email content. This is a quick way to get your email sent to the trash. This technique of enticing opens and clicks from your audience may have worked when email was in its infancy, but smarter, busier, and often passive Millennial users aren’t interested in mystery email. Everything they need to encourage them to open the email should be in the subject line. Use action or intent-oriented verbs in your subject line. Much like the subject of clarity noted in the previous tip, use an active verb, such as buy or register, in your subject line to highlight what it is your audience members will need to do once they open the email.